Fileteado is a type of artistic drawing, with stylised lines and flowered, climbing plants typically used in Buenos Aires. 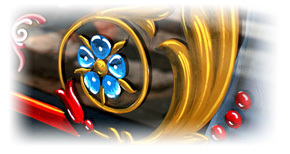 It is used to decor all kind of beloved objects, signs, taxis, lorries and even the old Colectivos, Buenos Aires’ buses. Filetes (the lines in Fileteado style) are usually full of colored ornaments and symmetries completed with poetic phrases, sayings and aphorisms, both humorous or roguish, emotional or philosophical. As an example, you can visit the website of the well-known artist Alfredo Genovese, with a good brief history of fileteado art, and some galleries to learn more about this particular porteño style.